We’ve arrived at the end of Jazz Appreciation Month, so I thought it would be nice to draw attention to the Floyd Bean Papers (MS 55). Bean was a jazz pianist from east central Iowa (Ladora and Grinnell). His first professional gig was playing with fellow Iowan, Bix Beiderbecke. However, his big break came in 1939 when he joined Bob Crosby’s band full-time. Throughout the rest of his life, Bean played and recorded with many other jazz musicians as well as composed his own music. Below is an image of a jam session Bean (not pictured) had with two members of the Duke Ellington orchestra. The collection contains Bean’s own arrangements and musical compositions, photographs of Bean and other jazz musicians (including personally addressed photos from Cleo Brown, Sidney “Big Sid” Catlett, and Earl Hines) and a variety of other kinds of materials documenting jazz and jazz musicians. It’s a great resource for Jazz Appreciation Month. We’d love to have you stop by and take a look! Also, be sure and listen to Iowa State’s own jazz band some time. 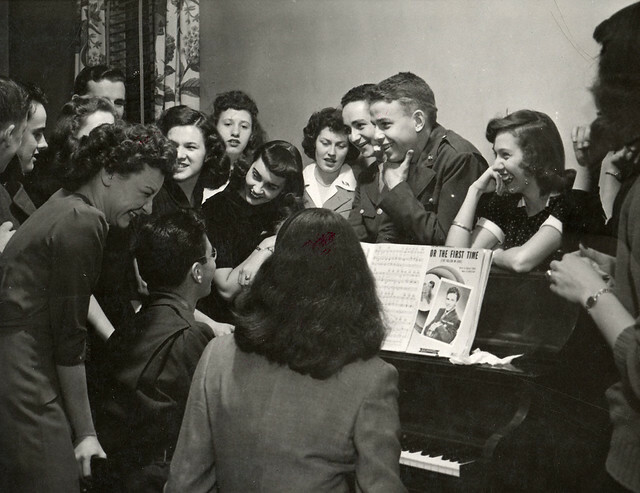 Students gathered around a piano, 1944. Sometimes we like to share photos purely because we like them. This is one of those photos. I love it, even though I know little about it. All I know is that it is an example of student life at ISU in 1944 – but whether this is part of a class, extra-curricular activity, or just a regular social sing-a-long, I can’t say. Some of the reasons I love it include the era (the 1940s is one of my favorite decades, if not my favorite), the fashions, and the idea of an old-fashioned sing-a-long around a piano. Yes, today we have karaoke machines and video games that serve the same purpose, but it’s not quite the same. For a bit of extra fun, here’s a recording found online of the song next to the one they are playing in the photo (if I only knew what the open sheet music is!). Enjoy! This photo and many others involving student life can be found on our Flickr page and in our photograph collection. Also, feel free to stop in and take a look at any of our student life-related collections! It’s National Poetry Month, and our department has several collections involving poetry. 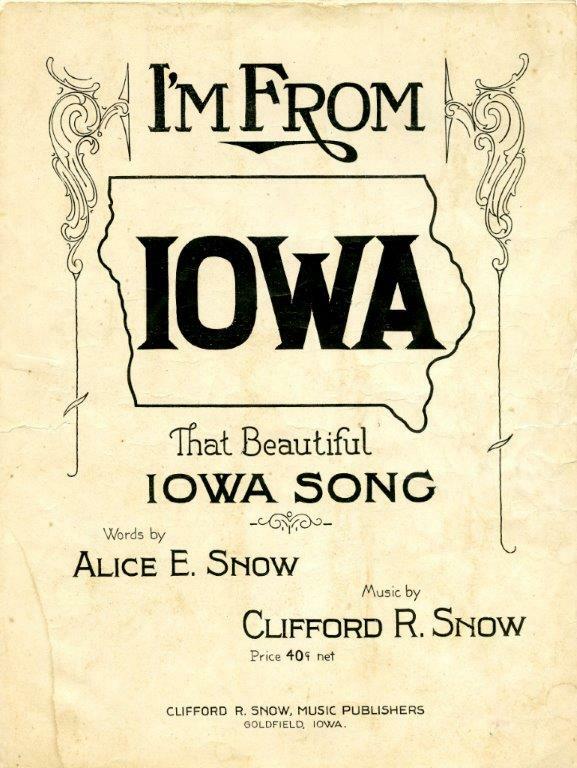 One of particular interest may be the Iowa Sheet Music Collection, MS 474, a collection of songs by Iowa songwriters and/or about Iowa. Songs, as you may know, are essentially poetry set to music (one could even argue that music is a sort of poetry, but let’s not go there today). 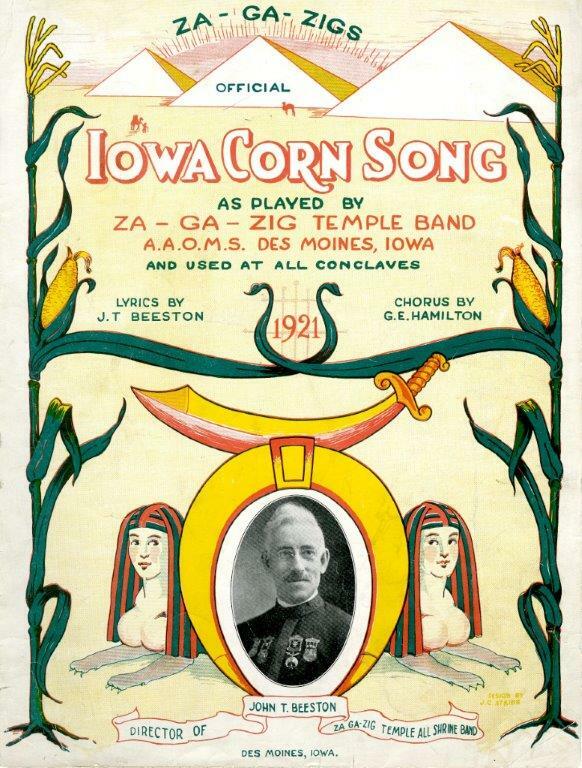 Within the collection, the songs about Iowa truly showcase Iowa pride in the early 20th century. We’re more than just corn. We also have soybeans. 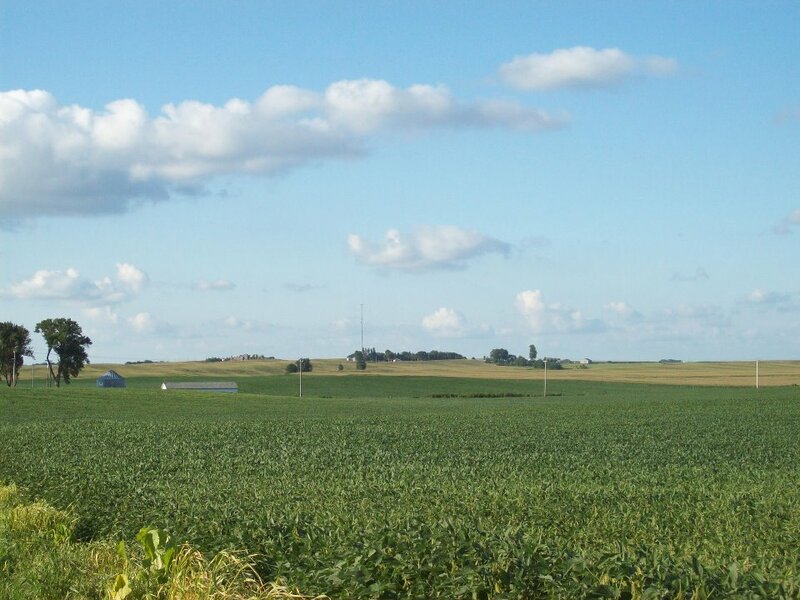 Hamilton County, Iowa, summer 2011. Photo courtesy of Whitney Olthoff (myself). Iowa pride. It’s an actual thing, though people not from Iowa may wonder why on earth anyone would be proud to come from this state. As someone who spent a couple years out of state, I’ve gotten my share of “what do you… like… DO there?” and “do you mean Ohio?” or, “oh, you grow potatoes there, right?” No, we are not Idaho, nor Ohio, nor should it warrant a disappointed or pitying reaction. I missed my home state quite a lot when I was in Indiana (even though southern Indiana is a beautiful place). Sure I missed my family, my friends, my dog, my favorite restaurants… but I also missed the land itself. It can be very beautiful with its rolling hills and patchwork quilt fields. But above all, it’s home. I love it, and lots of other Iowans love it, too. Now before I get carried away and go on and on about the understated awesomeness that is Iowa, let’s focus on other people’s love letters to this state – in that form of poetry loved so well, song. 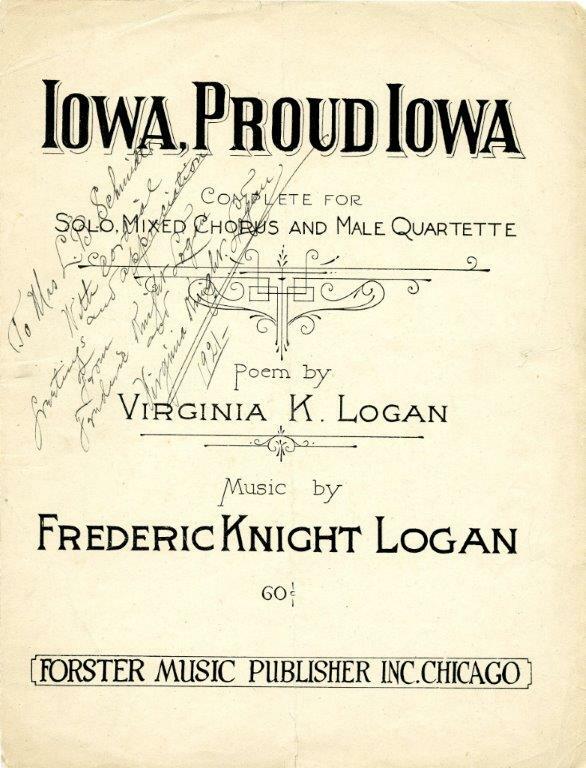 “Iowa, Proud Iowa” by Virginia K. Logan and Frederic Knight Logan, 1920. The inscription implies this was a gift from the Logans to Mrs. L. B. Schmidt. “All hail! Iowa, Queen of the West! Either “queen of the west” was a common phrase for Iowa at the time, or this alludes back to “Iowa, Proud Iowa.” Either way, it’s interesting. The other theme here and throughout much of this list is homesickness. Clearly, it has played a significant role in the love for Iowa. So many of these songs convey a sense of longing for the author’s homeland, it makes one wonder whether this is common with all places, or if there is something different about Iowa that draws people’s thoughts back here. A discussion for another day, perhaps. “Dear old flag of Iowa. Wave, O, Wave. You’re the emblem of a noble state. Wave, O, Wave. And they’re both just a little bit wrong. It’s the post-master’s friendly hello. Yet another song that harkens back to an earlier song on this list! Several of the songs in the collection use “Ioway” as a pronunciation, though of course no one today pronounces it that way. Mr. Willson has the right of it. And again, there is a hint of homesickness in this song. Oh, what papers could be written on this subject (hint, hint). Keep in mind that this is only a small selection of the songs in the Iowa Sheet Music Collection. To see more, as well as songs not about Iowa but by Iowa songwriters, stop in and see us sometime!